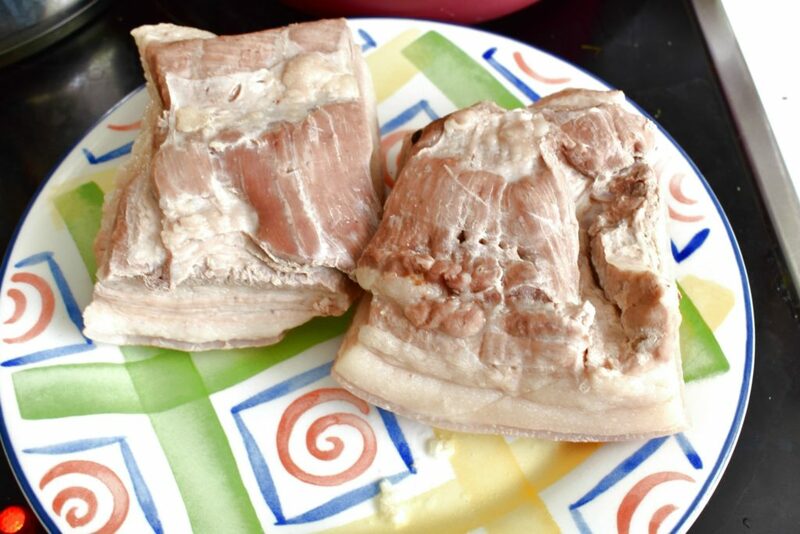 The easiest way to prepare the pork belly is simply to boil it. Fear not as a couple of carelessly selected spices will do the rest for a delicious dish. Who doesn’t know the crispy bacon right? It’s the staple food of the English speaking world and slowly but surly conquering the other part of the world too. 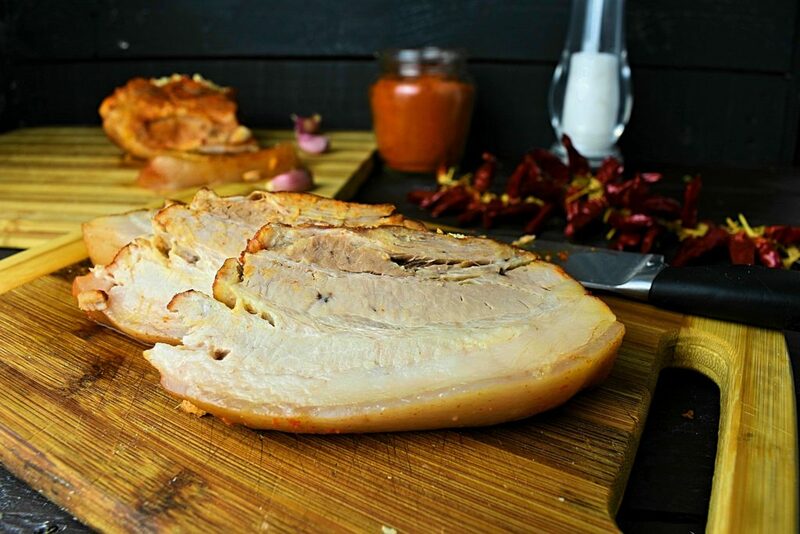 Bacon can be made of various part of the pork but the most common way is to cut it from the pork belly. After cutting the meat from the carcas it’s being cured either by injecting in or soaked in brine. After the curing process it can be dried in cold air, smoked, or boiled. The bacon is ready to be eaten after smoking or boiling but most of the time it is further cooked in the cosyness of our kitchens. The bad thing is with shop bought bacon though is that in the process of curing they add all sort of ingredient to taste better, look better, cure faster or increase its shelf life. Unfortunatelly some of these ingredients -nitrates and nitrits- increase the risk of developing cancer later in life. This should be a pretty bad news for us all if we wouldn’t know better ways to enjoy life little pleasures. Luckily bacon can not only cooked at home but can be cured and treated as well. As it always takes time and a bit of effort but so does all the good thing in life. This way we will really appreciate the food and know what we are having on our table. Curing is really a bit of a daunting process that requires some space in the kitchen or fridge. If someone is opting for injecting the meat with brine then it is a time consuming job as well. Not that it wouldn’t worth the effort but it’s good to know to before we jump at the task. We can make some really amazing things when let our senses lead us. Just think what honey and mustard would create with rosmary in a week of curing. So, now that we have established that bacon and pork belly are essentially the same thing we can get started to do something about it. The easiest simplest way of doing things -apart from eating them raw- is by throwing them in a pot of water and cook them. This is exactly what we are going to do with our pork belly. No fluff, no injecting, no days of massaging it with thyme and garlic infused olive oil with balack pepper. Just plain old cooking with some fresh herbs that lying around the house. This may not sound a gastronomical challange because it really isn’t. To be honest it is even one notch behind the crispy pork belly that we can prepare in the oven with almost as less hassle as this one but it’s still a tasty little dish with so little hassle. 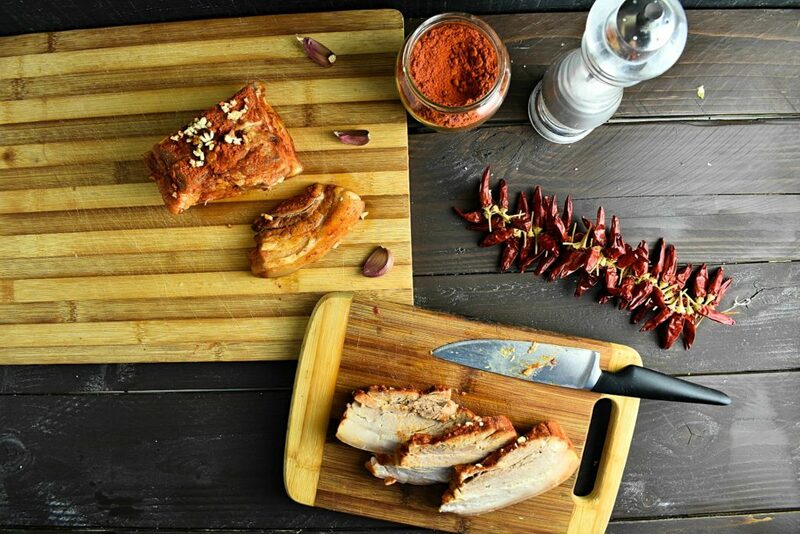 When we have the cooked pork belly we are free to season it with all the spices we love best but paprika gives it a unique flavor and appearance for sure. In case we plan to fry this further later on then skip the paprika as frying makes it sour and ruin our dish in a second. When it’s hot and soft it really tastes delicious but let it cool down completely to be able to cut the thin bacon style slices off it. Eating naturally is the best way to live healthy. 1. 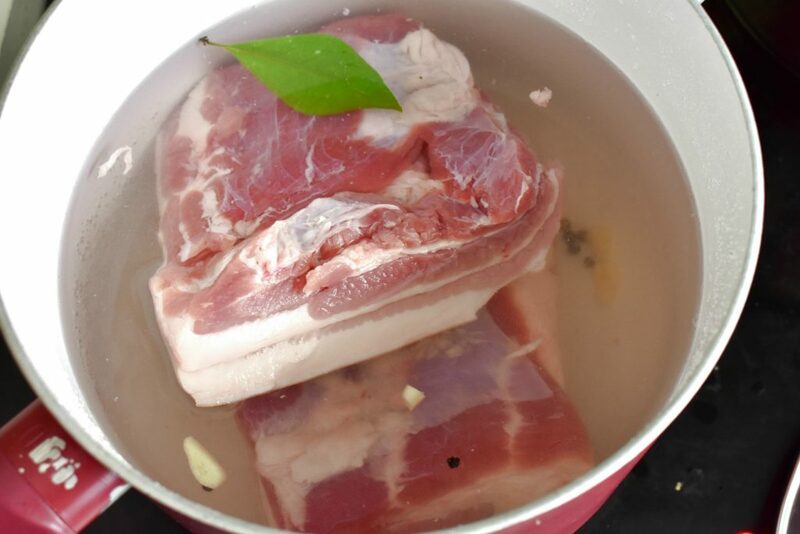 Put pork belly, whole garlic, black pepper, bay leaf and the cooking salt into a big enough pot. If we are fancy to add more herbs or vegetables to the water that’s fine too. There is room to experiment here with all sort of ingredients. Tomato, pepper, onion, parsley, lovage or marjoram will all deliver something unique to the end result. 2. Cook the pork belly for at least 1 1/2 hours on slow heat then take it out to a plate. 3. Use a fork to hold the meat while dusting it around with paprika on all sides. A sieve would come quite handy but it can be done by hand too. 4. Crush and dice the garlic up then sprinkle it on top. 5. 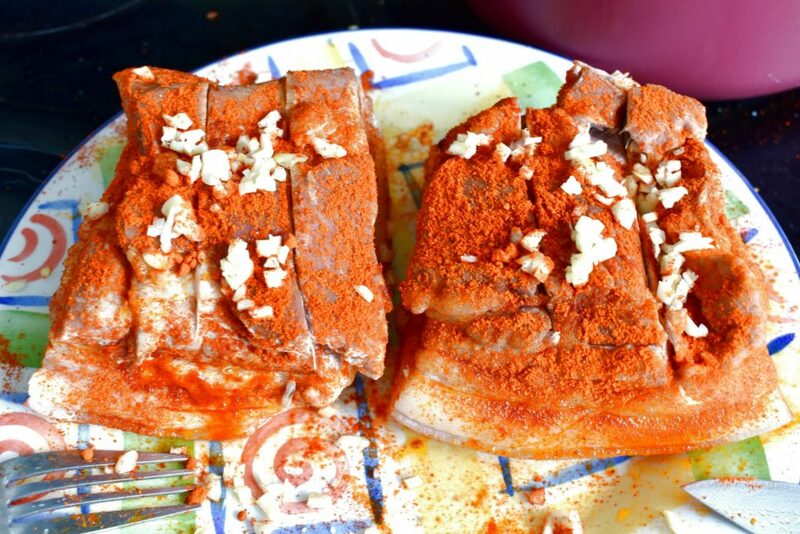 Sprinkle coarse salt on top and the boiled pork belly is ready. Serve it with salt and raw vegetables like tomato, pepper, carrot and salad. It can be kept in the fridge for at least a week and it’s ready to be used cold in salads or heated up with some cheese and eggs as part of a meal. Put pork belly, whole garlic, black pepper, bay leaf and the cooking salt into a big enough pot. If we are fancy to add more herbs or vegetables to the water that’s fine too. There is room to experiment here with all sort of ingredients. Tomato, pepper, onion, parsley, lovage or marjoram will all deliver something unique to the end result. Cook the pork belly for at least 1 1/2 hours then take it out to a plate. 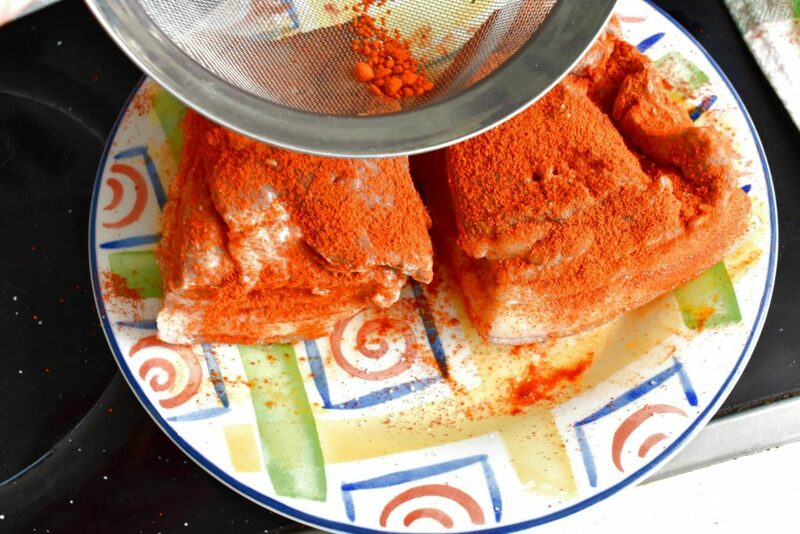 Use a fork to hold the meat while dusting it around with paprika on all sides. A sieve would come quite handy but it can be done by hand too. Crush and dice the garlic up then sprinkle it on top.